Jayell Smoke House is one of Michigan’s top 5 BBQ companies (Channel 4- WDIV 2016) and Couples Choice by WeddingWire for catering in 2017. Jayell Smoke House is a Veteran owned, fully licensed and insured BBQ Sauce/Rubs and Catering Company that services Michigan. Their clients, both local to Michigan and across the country, who have tasted the homemade BBQ sauces and rubs through the catering service asked to have the sauce and rubs available online. So now you can experience the taste right in your own backyard! Besides being available for all events and occasions, the Jayell Smoke House BBQ Sauce and Rubs are available to ship within the United States. Founded in 2012, Jayell Smoke House BBQ was created by David Leidlein to honor his loving father’s memory by sharing his love of BBQ with others. 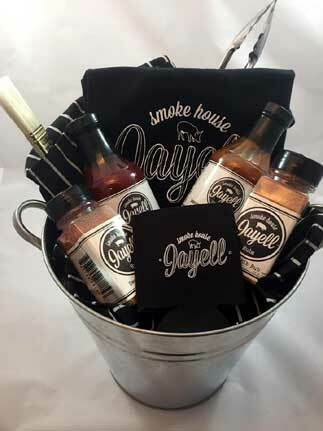 After years of development and research, Jayell Smoke House BBQ Sauce was born, offering unique flavors such as Root Beer BBQ Sauce, Ghost Pepper BBQ Sauce and Rub, Jalapeno BBQ Sauce and Rub, and more. There are many styles of BBQ sauce – from South Carolina style (mustard base), to Kansas City style (tomato-molasses base sauce). Jayell’s BBQ Sauce is a Detroit Style Sauce. The BBQ sauce has a pop base in some, to a water base for others. Jayell’s BBQ Sauce would be described as a thinner sauce. Behind the development of this sauce was for topping pulled pork. Jayell has created some very unique flavors. From Root Beer to the number 1 flavor – Belle Isle Red. But with the unique flavors and they style of the sauce it has been great on other meats. So use Jayell’s BBQ Sauce on anything from pulled pork to chicken, even top your mac n cheese! Enjoy!! What is the meaning behind the name Jayell? The meaning behind the name “Jayell” is that it was David’s late fathers nickname from his mother. It was the first letter of his first name and the first letter of his last name. JL- turned into “Jayell”. What is the meaning behind the Jayell BBQ Sauce names? Belle Isle Red- name after Belle Isle- which is an island on the Detroit River in Detroit Mi. “Honest John” Jalapeno- Named after David’s Great 3X’s removed. He was a senator for the Saginaw, Mi area. His nickname was “Honest John”. He died in a hotel fire in Lansing in the 1920’s. Bavarian Root Beer- Is the homeland of David’s family who came over to the states in 1840’s. Exit 224b Ghost Pepper- The exit off of I94 that exits to Harper Woods Mi, where David grew up and his father worked as City Manager for over 20 years. Rogers City Porter- Is name after a place David lived in for 5 years in northern Mi- Rogers City, Michigan. A great blend of seasonings, Jayell Smoke House offers over 15 all natural rubs in unique flavors…such as 1492 IPA Rub, Venison Herb Rub, Killer 5 Rub, West Coast Coffee Rub and more. Try these great tasting rubs on chicken, pork, fish, ribs, steak, roasts, potato chips, popcorn, hamburgers, chili and even macaroni and cheese to add a little zip or a whole ‘lotta kick!